In her short stories, essays, and novels, Cynthia Ozick explores themes ranging from the psychological legacy of the Holocaust to the challenges of maintaining Jewish identity in American society. Three of her stories won first prize in the O. Henry Competition, and five were selected for publication in the annual Best American Short Stories anthologies. Ozick published her first novel, Trust, in 1966, following up with The Pagan Rabbi and Other Stories, Levitation, and The Puttermesser Papers. 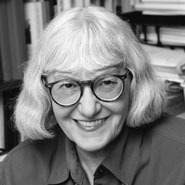 Throughout her career, Ozick has received both a Guggenheim Award and a National Endowment for the Arts fellowship, and was shortlisted for the Man Booker International Prize.